Horse-Shoe Nails: Or, New Ideas On Old Subjects, by Minor Hugo L.J. Hansard? 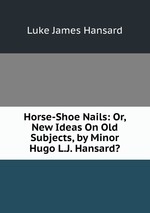 Аннотация к книге "Horse-Shoe Nails: Or, New Ideas On Old Subjects, by Minor Hugo L.J. Hansard?"